And as He passed by, He saw a man blind from his birth (John 9:1). This passage doesn’t provide any geographical references other than the Pool of Siloam, so we can’t be sure where these various conversations took place. 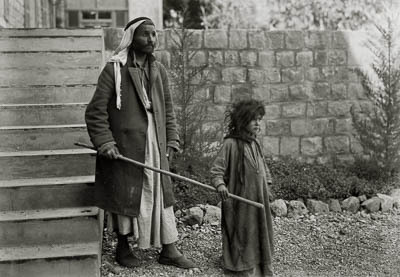 However, photographs like this can help us imagine how the streets of Jerusalem looked in Jesus’s time. 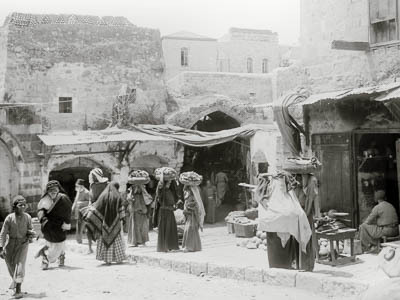 This particular scene was captured near the Damascus Gate sometime between 1898 and 1914. Rabbi, who sinned, this man or his parents, that he should be born blind? (John 9:2) In asking this, the disciples are assuming that physical deformities are a punishment for specific sins. This way of thinking, only marginally less prevalent today, might be influenced by Exodus 20:5. In it, God describes himself as “visiting the iniquity of the fathers upon the children.” But as Jesus’s answer makes clear, this assumption is too hasty. He said to him, “Go, wash in the pool of Siloam” (which is translated, Sent) (John 9:7). 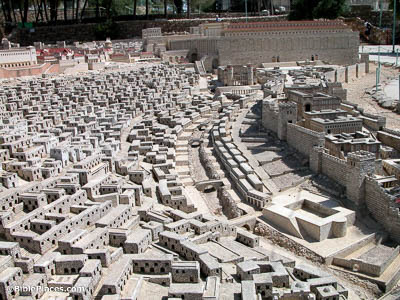 This model of Jerusalem shows where the Pool of Siloam lies in relation to Jerusalem’s other landmarks. The pool itself is in the bottom right corner, with Siloam Street curving up through the valley. In the distance, the Temple Mount can be seen. Since the previous passage has Jesus leaving the temple courts, it’s likely that Jesus met the blind man somewhere in the streets north of the Pool of Siloam, and then sent him south to go wash his eyes. So he went away and washed, and came back out seeing (John 9:7). 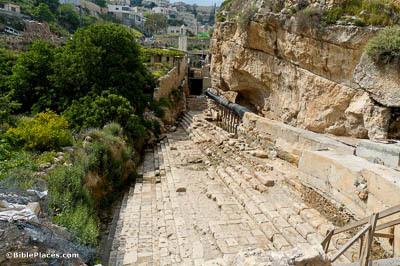 Just like with the Pools of Bethesda, the Pool of Siloam is far from fully excavated. 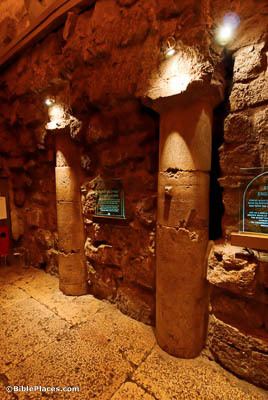 Because most of the remains are buried under private property, archaeologists have only been able to unearth this section, revealing a monumental staircase on the pool’s eastern side. The steps would have led into the water, which flowed from the Gihon Spring through Hezekiah’s Tunnel. If the staircase seems oversized, it’s because the pool itself was magnificent in scale; the northeastern and southeastern corners have been discovered, indicating that the pool was an impressive 190 by 160 feet (60 by 50 meters) in size. If anyone is a God-fearer and does His will, He hears him (John 9:31). The term “God-fearer” was a familiar one in Jesus’s day. 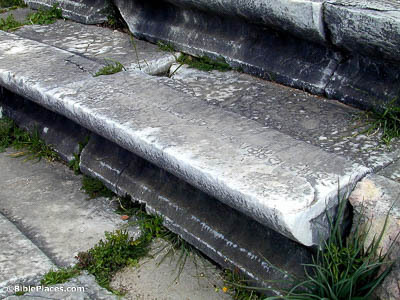 It was so common, in fact, that the term has been found inscribed on this seat in the theater of Miletus! Depending on the context, it could mean one of two things: it could refer to a Jewish person, or it could refer to a non-Jewish person who was attracted to the God of Israel. Though it is used the latter way elsewhere in the Gospels, in this case John is referring to reverent Jewish people. Jesus heard that they had expelled him; and finding him, He said, “Do you believe in the Son of God?” (John 9:35) Again, it’s impossible to tell exactly where Jesus had this conversation with the ex-blind man, but this street is one possibility, lying immediately west of the western wall of the Temple Mount. 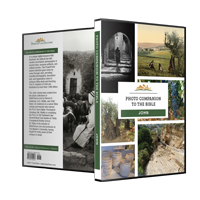 Jesus could have found the healed man here if he got news quickly of the man’s expulsion and sought him out before he had a chance to wander too far. Such haste wouldn’t be unreasonable, considering the nature of the conversation.